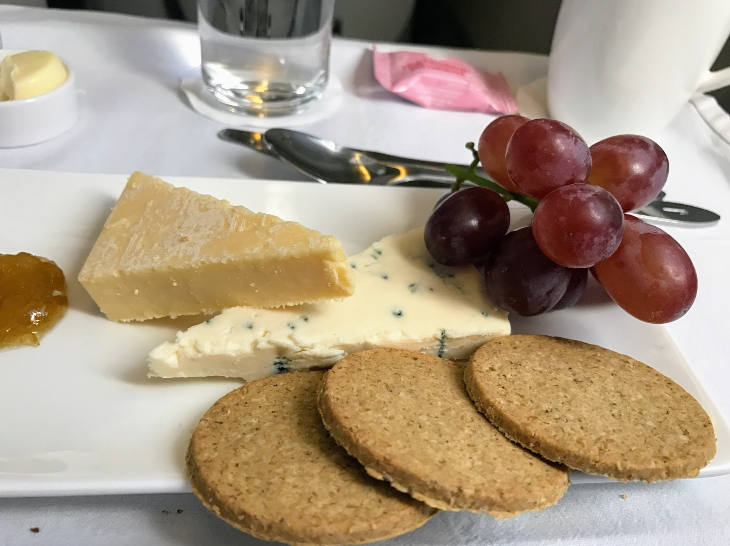 Last month I jumped on British Airways’ new Oakland-London Gatwick nonstop for a quick two-day business trip. 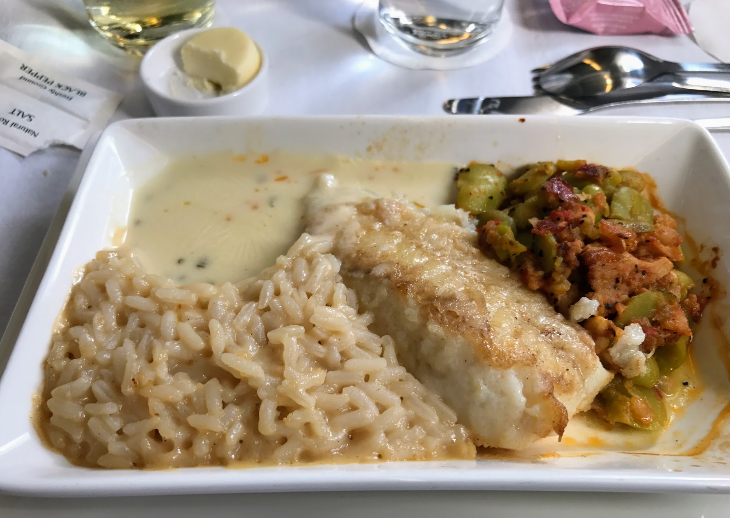 I’ve never flown to Europe from Oakland, so I was eager to give it a go and share my experience here. I was also eager to test taking BART from San Francisco to Oakland Airport. And in another test, I skipped my normal practice of taking sleep aids on this overnight flight. On the OAK-LGW route, British Airways is following in the contrails of Norwegian Air, which launched its Oakland-London Boeing 787 Dreamliner nonstops in May 2016 at rock bottom fares– as low as $400 round trip, but with many extra fees. Currently, the cheapest BA fares on OAK-LGW are running about $975 for economy class roundtrips in June. These economy class fares pretty much match Norwegian’s fares when you add in all Norwegian’s extras. Premium economy runs about $1,450 roundtrip. The least expensive business class seats are going for about $3,700 roundtrip, but in some cases climb as high as $7,000. When BA first announced the nonstops it offered a special economy fare of just $500 round trip, but that fare is long gone now that peak summer season approaches. 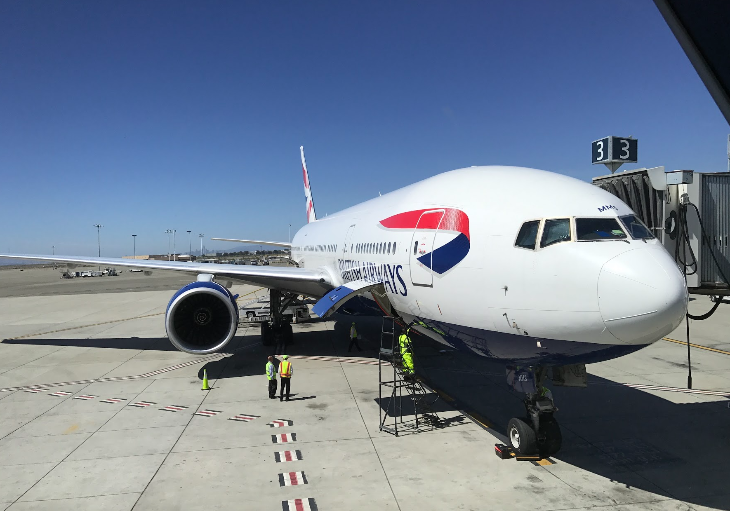 British Airways’ new Oakland-Gatwick flights operate four days a week using a Boeing 777-200ER that seats 275 passengers: 203 in economy, 24 in premium economy and 48 in business class. 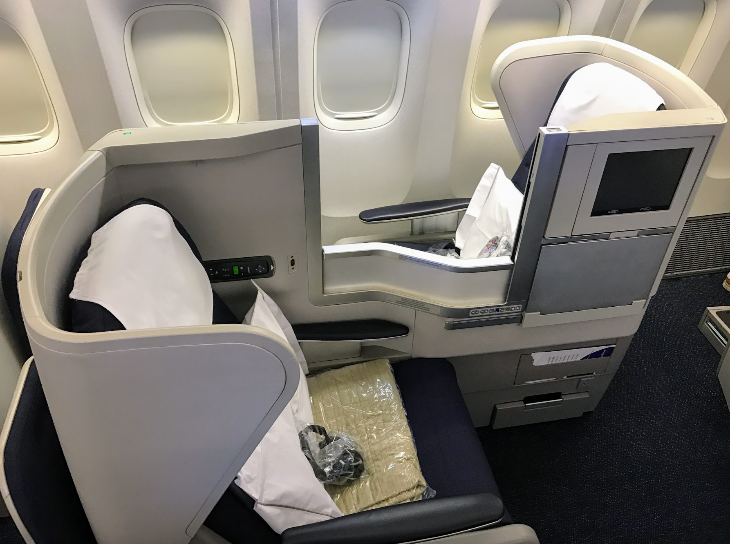 British Airways’ premium economy (aka World Traveller Plus) is in a separate cabin, bigger seats with 38-inch pitch, in-seat power, and choice of meals from the business class menu. 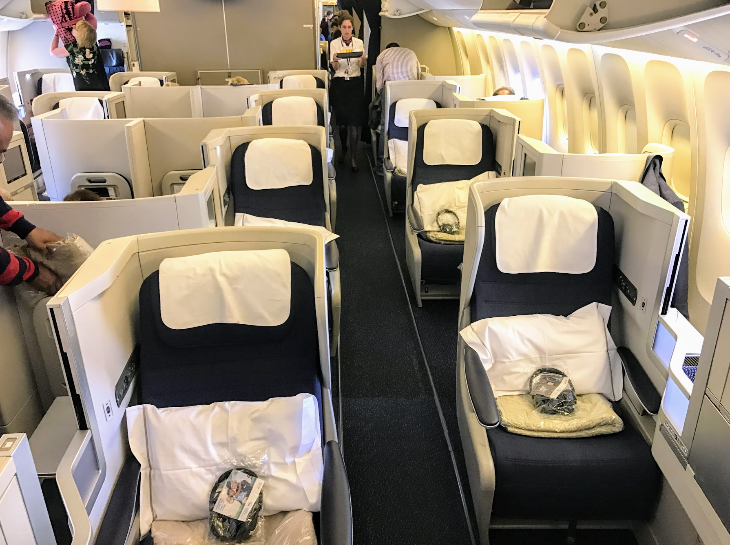 BA is the only carrier at OAK offering lie-flat business class seats to Europe. BA Club World (business class) travelers flying out of Oakland receive up to five days of free parking in OAK’s Premier Lot, an added value of $190. 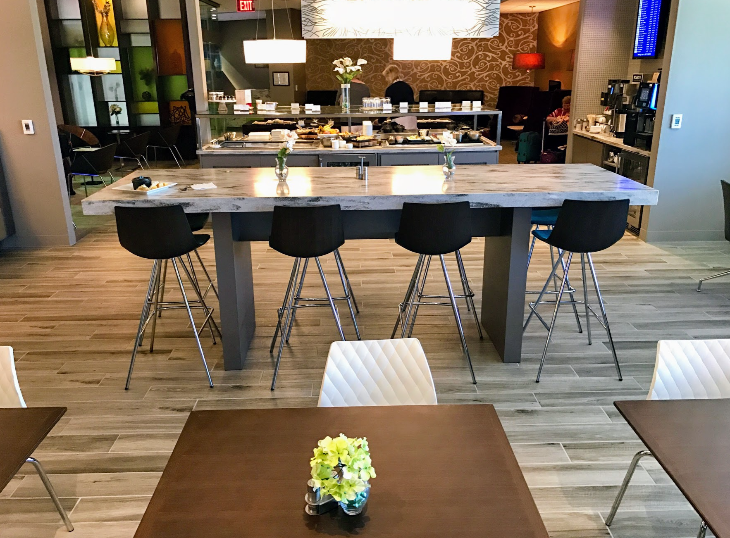 They also get complimentary access to a new Escape lounge located in Terminal 1 near BA gates. One-time passes to the lounge go for $45. Note: Chris McGinnis was a guest of British Airways for this trip to London to attend a press briefing. Here’s what that was all about! 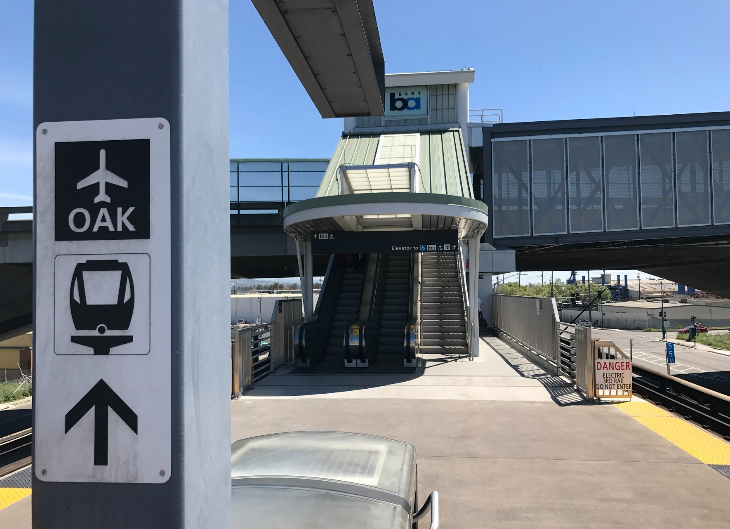 When taking BART to Oakland International Airport, you get off at Coliseum station. From there you walk up the steps to the new Oakland Airport Connector station for the short spur ride to the front door of the airport. 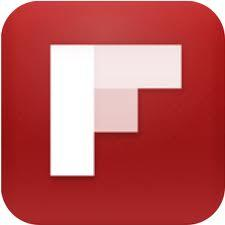 (Fares vary from your starting point, but run in the $10 range) Wanna see what that ride is like? Watch the video below! British Airways operates out of Oakland’s Terminal 1. When I first walked in I could not find the British Airways ticket counter among all the other counters in the main corridor. When I asked, I discovered that BA’s counter is in a new space (currently under construction) closer to the security screening lines. 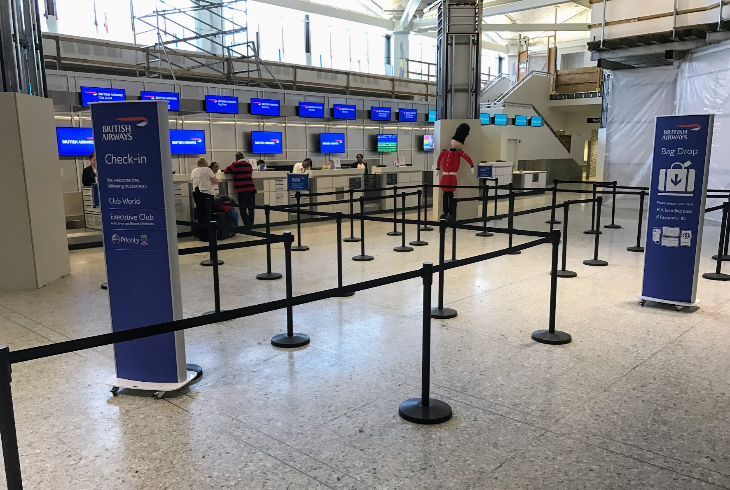 I picked up my boarding pass at the counter, breezed through security– I did not get PreCheck for this flight, although it is available at OAK– but did not really need it since there were only about 10 people in line at midday. 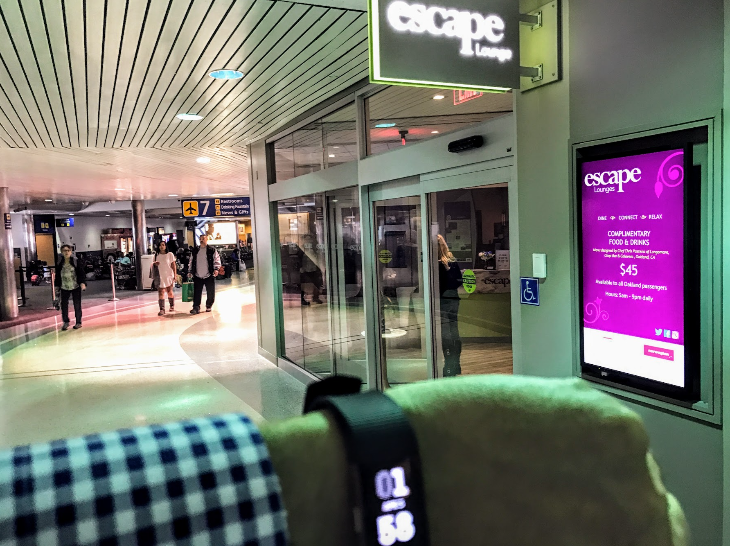 Total transit time from the BART station in SF to the Escape lounge beyond security just 70 minutes. Not bad! After security I headed straight to the new Escape Lounge– since I was flying business class, I had comp access to the lounge which was a nice quiet oasis from the hubbub of the terminal. 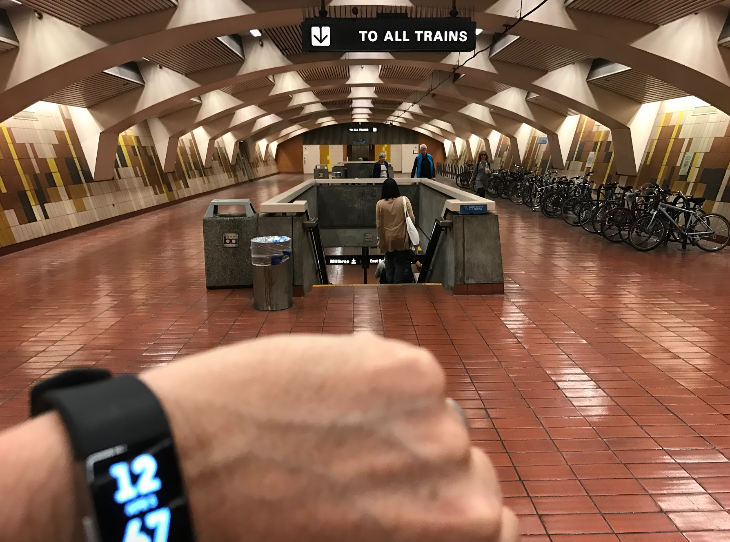 When I checked my watch, I was pleased to see that the entire journey from the BART station in SF, under the Bay in a train, connecting to the airport spur, checking in, going through security and walking to the gate took just 70 minutes! That’s faster and easier than I expected, and the ease of the trip probably had a lot to do with the time of day I was there (midday). If it had been morning or evening rush hours, it would have probably taken a bit longer. Now let’s go jump onboard! BA 2278 was scheduled to depart at 3:10 pm but was delayed until 3:50 pm. Flight time to London is 10.5 hours, and is scheduled to land at 9:30 am. 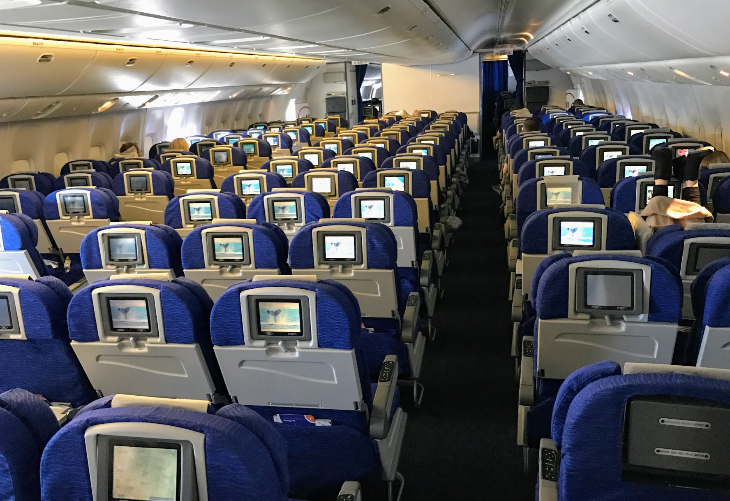 The Boeing 777-200ER deployed on this route is not a new plane, but the interior felt like it had been through a recent refresh. 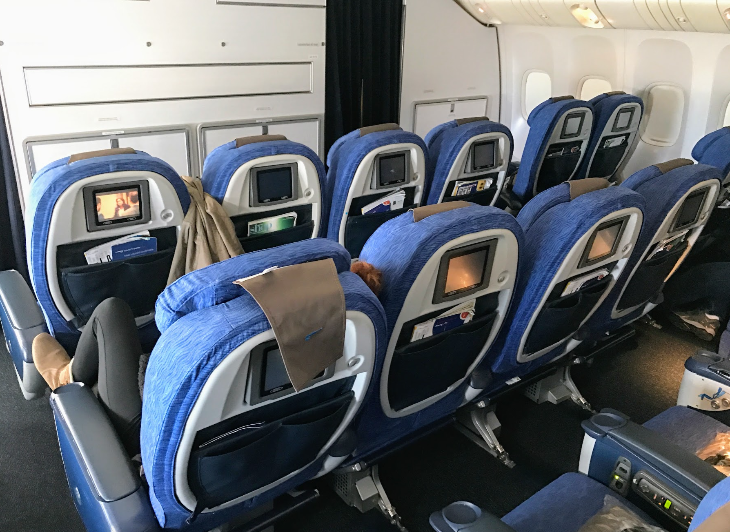 There were 48 business class seats in two cabins separated by a galley and it felt airy and bright with huge overhead bins. Luckily business class was only about 1/3 full so I was able to get a rear-facing window seat and did not have to face a fellow forward-facing passenger during take off and landing. To make life easier on the flight attendants, I left the translucent screen separating passengers down for the entire flight. 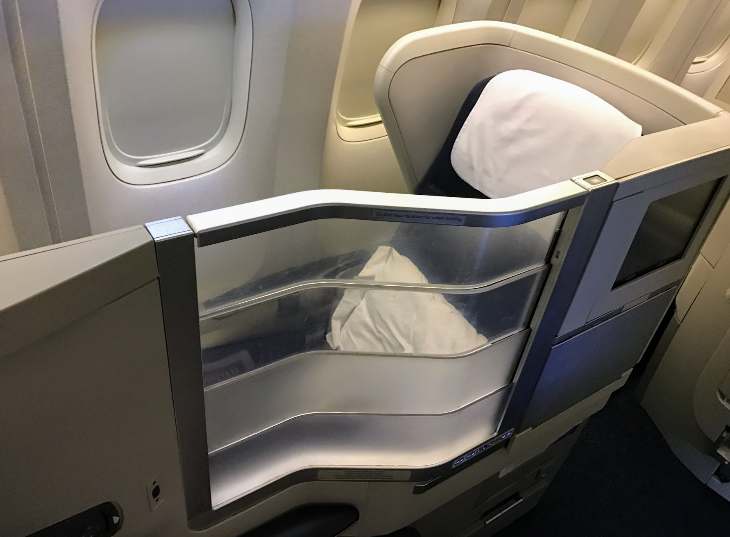 To me, the window seats in British Airways business class are the best because they are so private– you are really tucked away in your own cocoon over there (My seat is off to the right in the photo above- 3A). Aisle seats are much more exposed to activity in the aisle. Seats are configured 2-4-2. The downside to this set up is that window seat passengers must step over the legs of the aisle seat passenger to get out. That’s long been a bone of contention among BA business flyers, however, that should be changing soon. 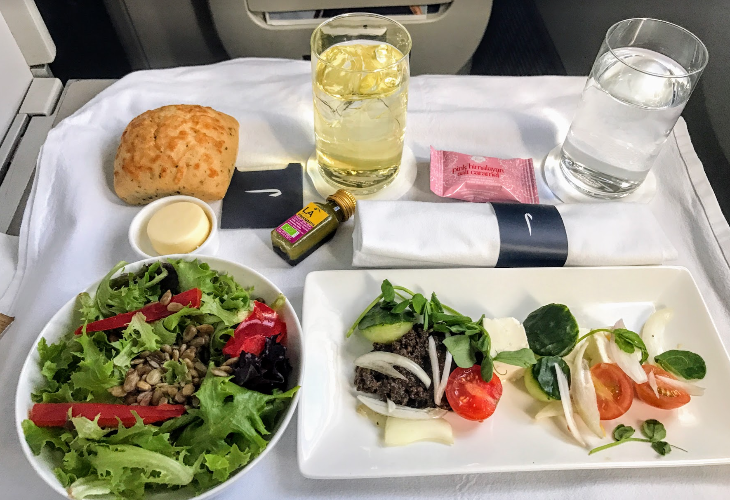 The reason I was on this trip in the first place was to meet with BA’s CEO Alex Cruz– and during that meeting he revealed that the next generation business class section would offer 100% aisle access- what was less clear is if the new seats would be forward and rear facing. Something interesting about those translucent screens– see below? When flight attendants look down from the aisle, the screen is transparent. But from the passenger level, it’s translucent, so when it’s up you can only see shadows of the passenger seated next to you. One interesting thing about taking off from Oakland Airport vs SFO… taxi time! From the time the door closed and we backed up, taxied and took off felt like about 10 minutes. Plus there were plenty of nice views of the marshes surrounding OAK from the windows. Shortly after take off, flight attendants came around with a drinks cart and nuts. 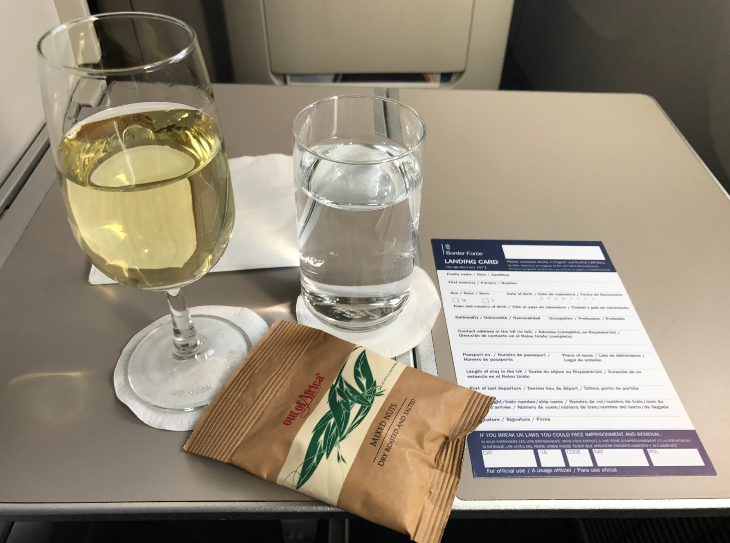 On this flight, the Kendall-Jackson California chardonnay listed on the wine menu was not in stock, so I settled for an Spanish Albarino. 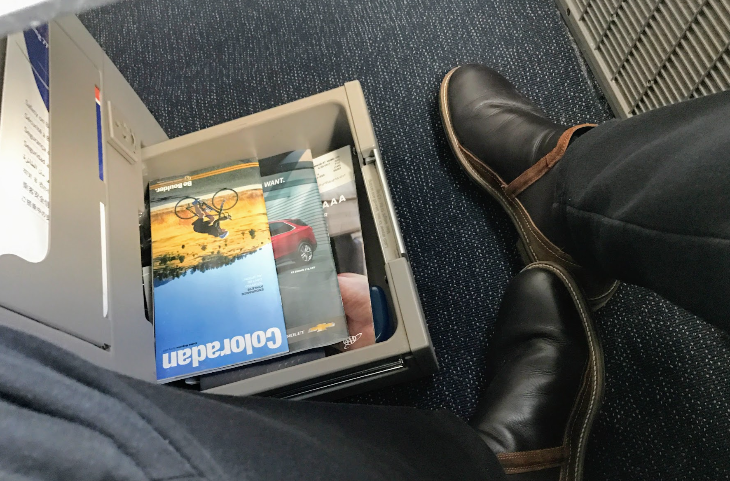 In-seat stowage space in BA’s business class is limited to this drawer by your feet– it’s big enough for a laptop, magazines, phone, headphones, camera, etc. Kinda difficult to access, but good to have. British Airways does not currently offer in-flight wi-fi on any flights… which seems strange given its global reach and reputation. It was sorely missed on this flight. However, on this trip we learned that BA is aiming to have nearly all its fleet outfitted with wi-fi within two years. First course was a fresh and colorful salad and as an appetizer I chose a “deconstructed Greek salad” of feta, black olive tapenade, tomatoes, carved cucumbers, onions and watercress. I’m usually not much of a beef eater so I chose the haddock. 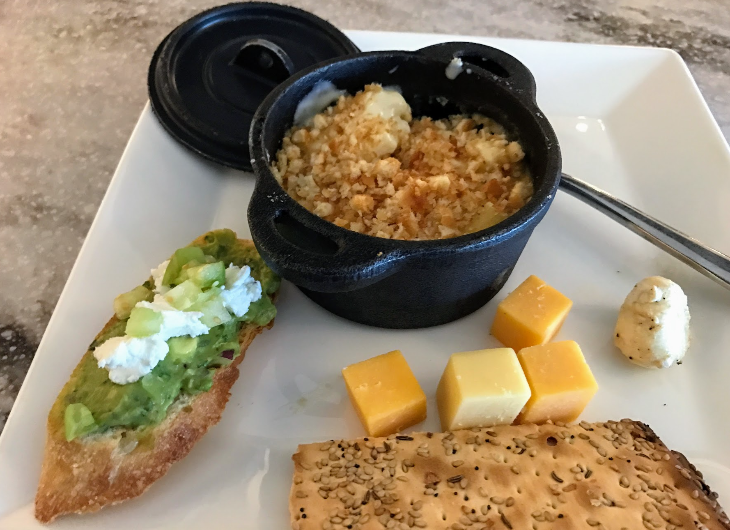 While the presentation of the meal was lacking, it tasted really good– creamy, cheese-y and fishy with a nice side of fava beans and rice. 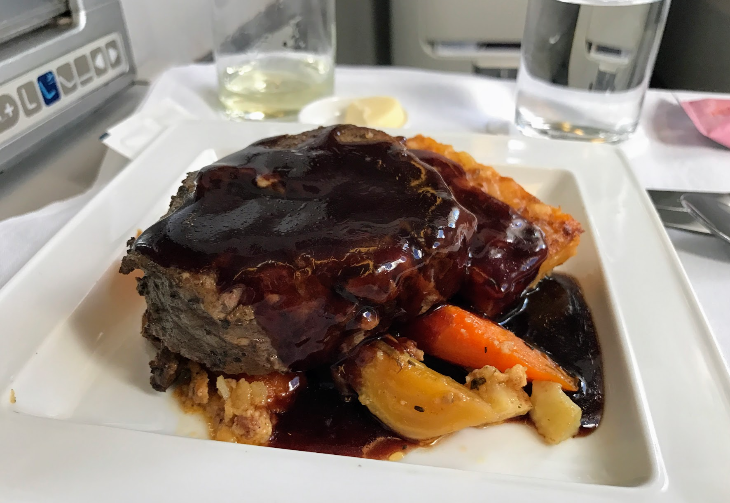 I asked flight attendants if I could see what the steak looked like– and to snap a photo. They happily obliged. Shoulda chosen the steak! Other mains included Pappardelle pasta tossed with kale pesto or a nicoise salad with grilled chicken. Some nice American cheeses with a tomato jelly and oatmeal wafers for dessert. 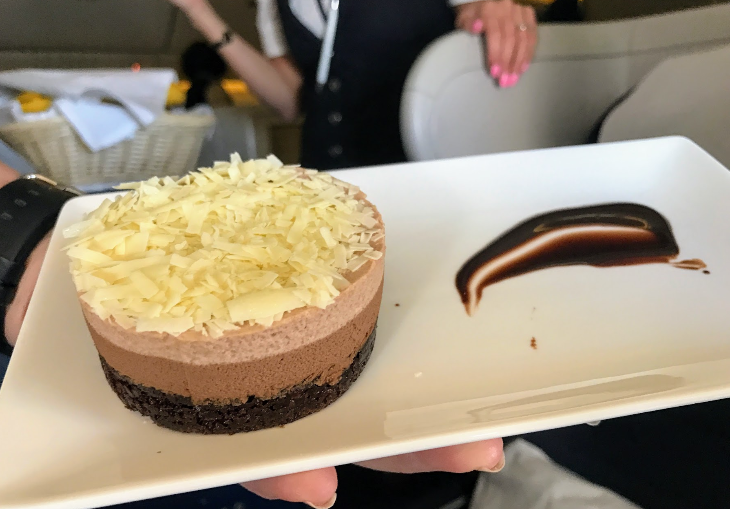 I passed on the chocolate mousse since I thought it might interfere with the sleep I hoped to get on this flight. After dinner I took a stroll through the plane and found it pretty empty. When I checked in, agents told me that there were only 95 passengers (out of 275 seats) in economy class. Not surprising considering this was during slow season, and only the first week of the flight. In premium economy there were only four passengers. It’s a quiet, cozy cabin located between economy and business class. seats are configured 2-4-2. Passengers can choose from the business class menu. Downside: When seats are empty, you can’t lie down flat across the rows due to the fixed arm rests. At the back in economy, this British Airways B777 is configured 3-3-3– thankfully not the emerging 10-across (3-4-3) standard- but that could change. In our meeting with Cruz, he indicated that Gatwick flights, which are more leisure oriented and price driven, could soon see 10-across, too. Time will tell. Since this flight was so empty, many coach passengers (who likely paid just $500 roundtrip) were able to snag what business class passengers pay dearly for: a long flat surface for sleeping. In the photo below, it may look like that middle cabin is empty, but there’s a body sprawled across each row! Back in my business class cocoon, I laid my six-foot frame flat and comfortably for 4-5 hours, but did not get much sleep. I experimented with not taking any sleep aids on this flight and learned my lesson! It did not help that flight attendants kept the cabin very warm for the overnight flight– for some reason nearly all European carrier flights are kept WAY too warm for good sleep. I would have loved to cuddle under the nice quilt provided, but used it as a pillow instead. Our flight landed at London Gatwick about 30 minutes late at around 10 am. Unlike British Airways flights arriving at Heathrow, there is no Fast Track through customs and immigration for business class passengers. Since other flights were arriving at the same time and lots of passengers to process, this meant waiting in line for about 30 minutes. If you want to avoid that wait, you can pay about $13 for Gatwick Premium access to get in a fast lane which was empty when I was there. Had I known about this, I would gladly have paid the $13 to speed through! Once I got through immigration, I sped through customs with my carry on bag and exited to the busy south terminal. 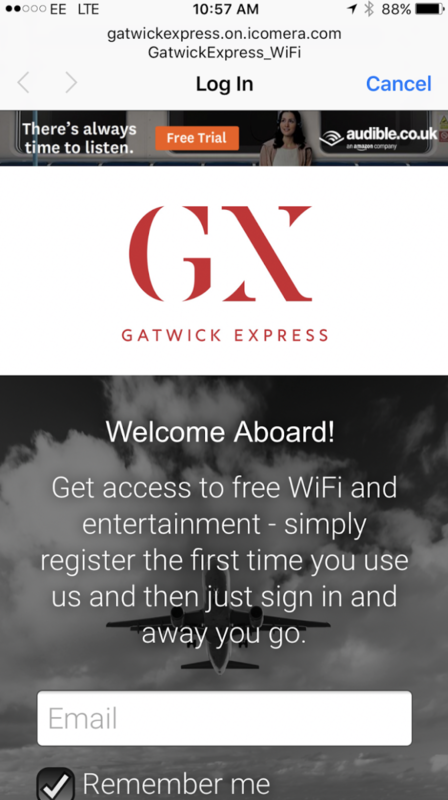 Finding my way to the Gatwick Express train was easy– the service has recently been updated, so there’s a dedicated ticket line in the airport. 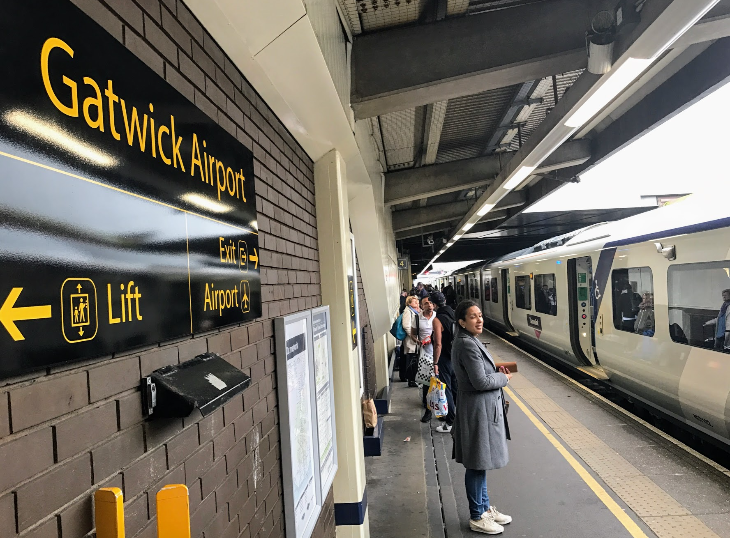 At Gatwick, BA uses the recently renovated South Terminal — recent improvements include a brand new business class lounge, and upgraded check in area, and easier access to the Gatwick Express. Gatwick Airport (LGW) is 28 miles south of central London but still convenient and even preferred by many travelers. Why? 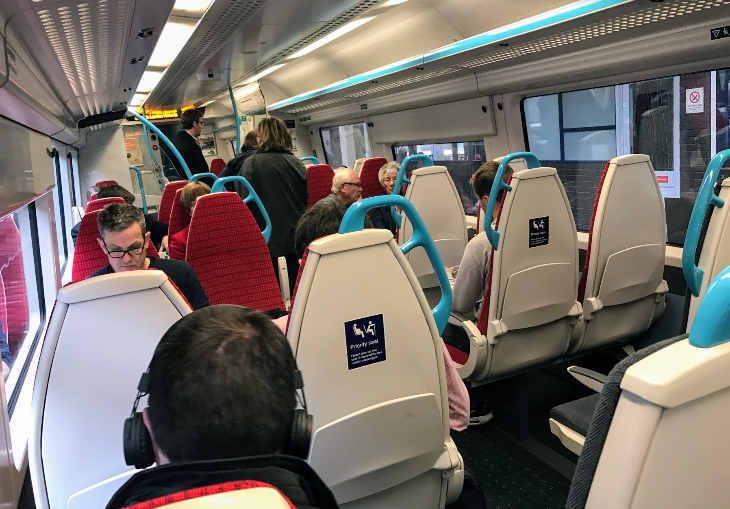 Because the easy 30-minute, approximately $25 Gatwick Express train whisks you from the airport to Victoria Station in the heart of the city every 15 minutes. There’s free wi-fi onboard– which makes it easy to catch up on emails that have arrived overnight. 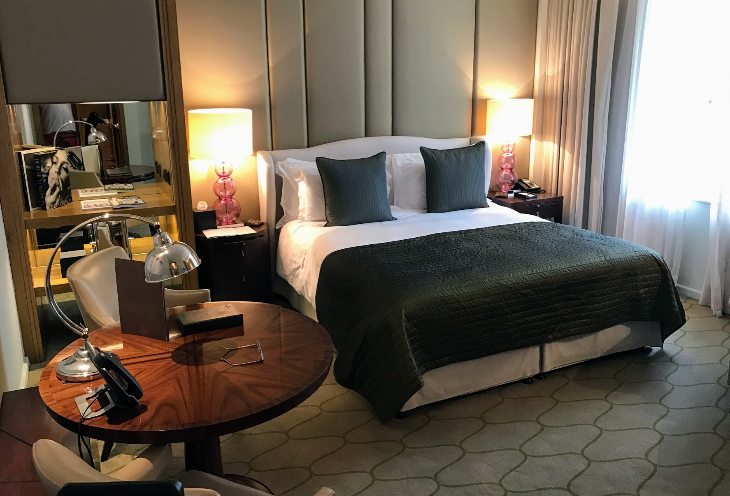 British Airways put us up at The Corinthia, one of my favorite London hotels, for two nights. It’s located on the banks of the Thames near the Embankment and Charing Cross stations. The taxi fare from Victoria station to the hotel was about $15. Here’s my bedroom at the Corinthia, but check out the view from my window! Have you flown British Airways before? What did you think? Would you give it a go on the new Oakland-Gatwick flight? Please leave your comments below! Disclosure: Chris McGinnis was a guest of British Airways for this trip, which included roundtrip air transportation and two nights hotel. TravelSkills covered all other costs related to the trip.